A combination of over-the-tops Bitcoin price predictions by Tim Draper and favorable developments in the crypto-verse could cement our previous Bitcoin price forecasts. Further strengthening this position is news that Morgan Stanley plans on creating their Bitcoin derivatives. Coincidentally, and more positive for Bitcoin and other cryptos, more hedge funds are looking to funnel their capital into this nascent field. Tim Draper is a Bitcoin perma-bull and that’s a relief for investors who bought at the top and have to contend with 75 percent losses. According to Tim, the disruptive cryptocurrency market cap would explode to a whopping $8 trillion market cap with the Bitcoin leading the charge. Speaking via video link at the Deal Street Asia sponsored event held in Singapore, Tim said there is one key ingredient that makes Bitcoin and blockchain technology unique and different from the internet. While the internet went after billion dollar industries, blockchain and cryptocurrencies will be disruptive finding use in trillion dollar companies within the finance, insurance, health care and tech sectors. He may be right because regulators from leading global economies as China, US, UK, Canada and India are bullish on blockchain technology thanks to its inherent features prioritizing transparency and efficiency. 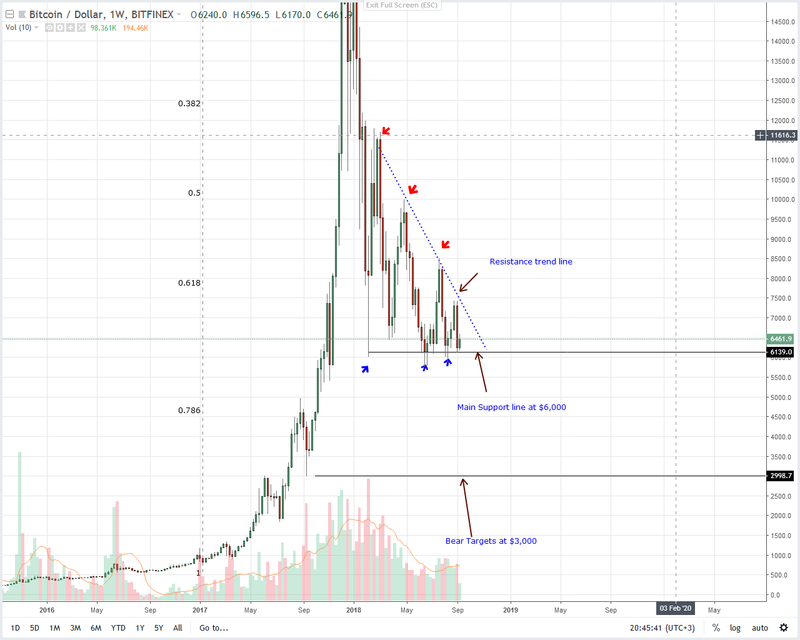 He even said last year’s price acceleration to $20,000 was due to ignorance and this year’s drop is actually a primer for a pent-up rally that would propel Bitcoin to new highs of around $250,000. At current market cap, that’s a massive 400X increase a prospect that will further increasing demand. From a neutrals point of view, comments from Draper are outrageous but this is not the first time he has emphasized such. From a long term perspective, the trend is clearly bearish. This is after that market deflating drop of Bitcoin prices from $20,000 peaks to $5,800 late last month. But, from the chart, the $6,000 mark is a clear support line. It’s where sellers have found resistance six times in the last six months. The result is a wedge with floors at $6,000 with an eight month resistance trend line capping gains. Unless otherwise, we need strong price surges above that resistance trend line at $6,800–$7,200 level for buys to be valid. When that happens, Bitcoin prices will likely surge towards the $10,000 and later the $12,000 mark. Before then, we recommend a conservative approach and taking a neutral stand in line with our last Bitcoin price analysis. 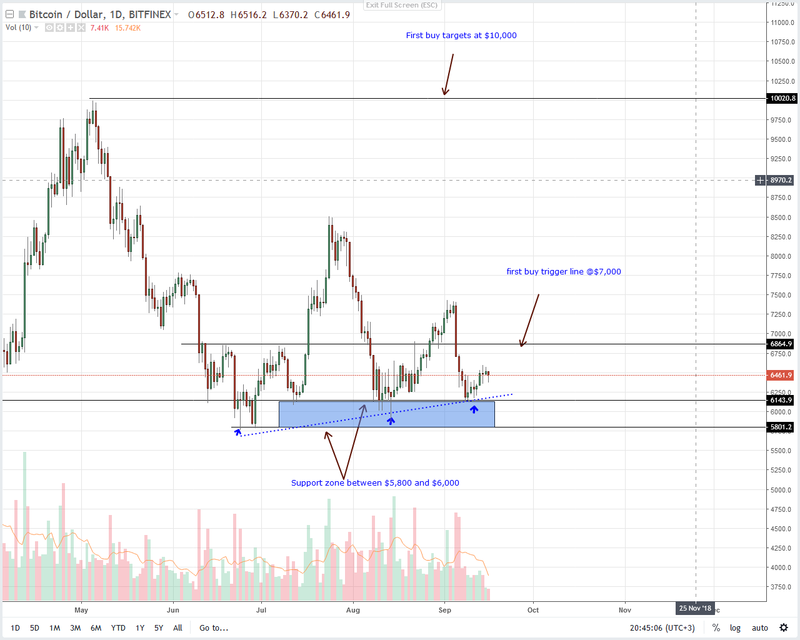 There are two levels of support in this time frame: the three month support trend line and the important support zone between $5,800 and $6,000. 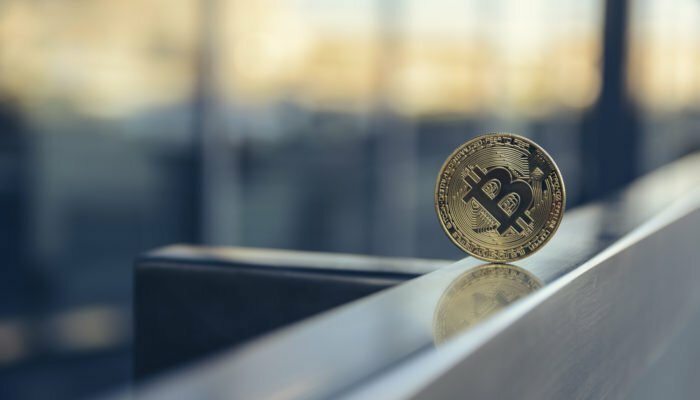 Already, Bitcoin prices did find support at the trend line and the result is a three percent week over week gain triggering risk off buys with targets at $7,000 mark. Going forward, I recommend taking a neutral stand. That’s until there is a high volume break and close above $7000 and $7,200.$7,200 is the resistance trend line in the weekly chart. That would be a bullish break out and the necessary footing for market boosting gains. Thereafter, risk on Bitcoin buyers can begin initiating longs on every pull back in lower time frames. Reasonable targets will be at $10,000.